On our second day in Cebu, we planned visiting Kawasan Falls. 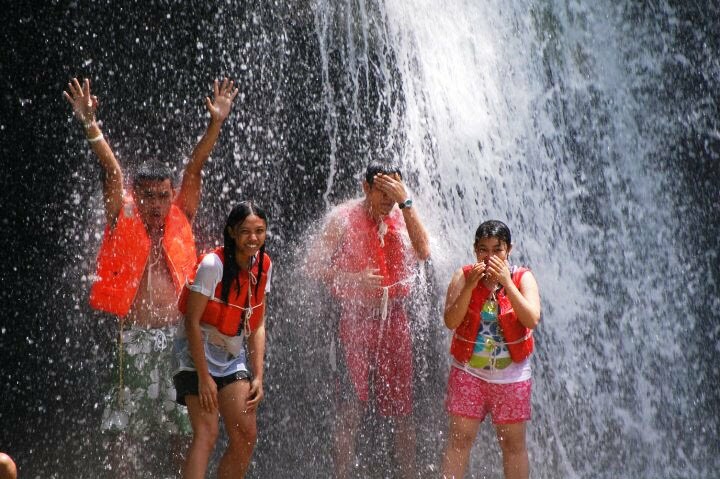 Kawasan Falls is located in Badian, southern part of Cebu. 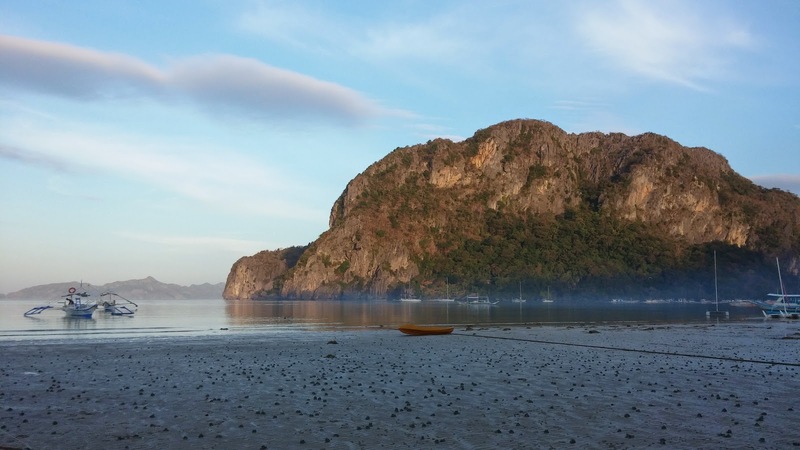 This is most likely 3-4 hours from Cebu City. Long journey to see the beautiful falls, nevertheless, it was worth it. Take a cab (less than Php 50.00 for us) and tell the driver to bring you to South Bus Terminal. Just ask around the terminal what bus will bring you to Kawasan Falls. People from the terminal are very friendly. They'll be dropping you at Matutinao Church, and you're going to make a 20-minute walk to reach the falls. It's just an ordinary bus, I'm not sure what's the schedule of aircon bus or if there's an aircon bus. But mostly buses here leave the terminal every hour. Another option is to ask the cab driver to bring you to Citylink V-Hire South Terminal. This terminal are for aircon vans for hire, but mostly it's better if you're in a group of 10 or more. And now, we finally reached it! If you didn't bring any food with you, that's all right, some locals here operate food business. I just don't like the sinigang served to us. Tastes like a paksiw to me, it contains ginger and red bell pepper too. I don't know if this is how Cebuano cooks their sinigang, or just the one we ordered. 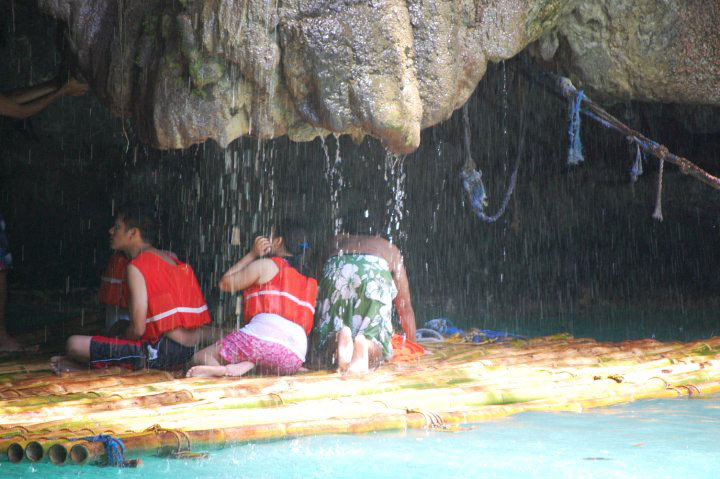 Kawasan falls has 3 parts. You can climb up more to see another huge falls, and climb up again to see the topmost falls where it is coming from. As we were somehow exhausted and tired, we're good here. Hehehe. If you wanted to stay here for a night, there are rooms available on the lowest and second level of the falls. 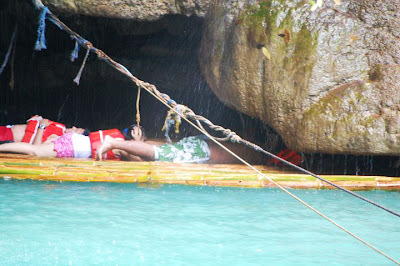 Our raftman Kuya Jun told us there's a Php 1,000 room on the second level of the falls. Be Prepared! Most locals here will ask for a tip! grabe ang ganda jan sa kawasan! you're right guys! Kawasan is fantastic! will visit this place soon on july! nice! Hi, thanks for sharing this. I'll be going to Cebu sa last week of Sept. till Oct.4 and top proiority ko ang Kawasan and Basdaku. Your post is really good for reference and it seems recent pa. Curious lang ako. It appears na you rode a balsa. Most likely, I'll be there alone, where can I leave my things if I decided to swim or get wet. Suggest nman please, kayo ba? how did you manage to keep your things? I'll read your other posts. Well, at the start of walking towards kawasan falls, there's a tour guide that would literally invite himself to be your tour guide. hehe. That guy is actually the one who raft that balsa on the pic, we rented a cottage and his brother (another local tour guide) take our pictures while we're at the falls. His brother take our pictures near our cottage so he take care of looking on our things. Being tour guides, we gave them tip separately. When we were there I didn't see any other place to put our things so we rented a cottage. Maraming tao sa pinakalowest part ng falls so parang hirap makita kung lapag mo lang kung saan saan ang gamit mo. Not sure on the the second level of the falls kung mas konti ang tao. And one more thing, while we're swimming at the falls, most likely we always look on our things from afar haha. From other blog I saw there are kids that could be your guide as well, so if you have one, she/he can take a look on your things. Well from our experience, nothing was missing. There are also room accomodations if you really wanted to secure your things. wow, thank you tlaga. I enjoyed your write-up, nice pics and may menu pa :P for budget concious like me, importante to na may info bout sa prices. Kawasan is in cebu, hope you'll visit it soon! enjoy! 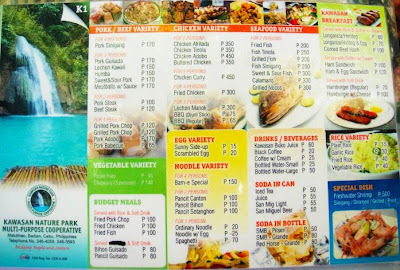 p300 is for 1 person or unlimit ? it's for the whole balsa/raft rent. unlimited no. of person as long as the raft can still float. :) i've seen more than 10-15 people in this balsa, so if you're in a group, most likely you'll pay less. Thank you for the very informative IT. We opt to follow your IT on our coming trip this January. However, how was the trip back to your hotel from the falls? Any suggestion on what time to leave the falls, any schedule on the ride back to Cebu city? Looking forward to your positive response! nice place...very refreshing, relaxing and adventurous as well. just a shame, that when i visited i forgot to bring my swimming things so didn't get a chance to swim, but will do next time for sure!! Oh, such a nice place! I really love the blue clean water there. Thanks for your sharing!